Located in the popular resort community of Trillium, this spacious two-story home features 3 bedrooms and 3 1/2 baths and is just a golf cart ride away from the clubhouse, pool and tennis courts. Wraparound decks on the upper and lower levels overlook the picturesque 14th fairway. 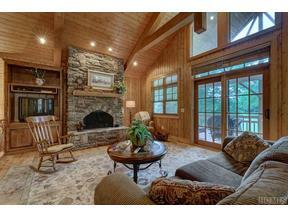 Lovely great room with cathedral ceiling is the perfect area for entertaining family and friends. The beautiful furnishings are also included, as is a nearly-new golf cart with storage space in onsite golf cart barn. Life in the mountains doesn't get any better than this. Unlock the door and you're home! MEMBERSHIP INITIATION FEE TO TRILLIUM LINKS AND LAKE CLUB INCLUDED WITH THIS LOVELY PROPERTY!